The Raconteur in Edinburgh - A likely story? Billed as Stockbridge’s first cocktail bar, the recently opened Raconteur certainly isn’t playing upon a half-baked gimmick. 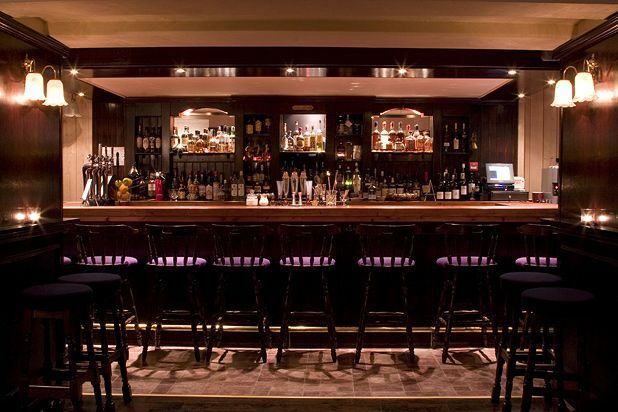 The three men behind it (Jamie MacDonald, Teddy Joseph and Nick Reed) have worked as cocktail makers and consultants in upmarket Edinburgh venues such as Tigerlily, Rick’s and Harvey Nichols, and the impression is that they want to run a bar for people who know what they like to drink. The sample cocktail list features such unique delights as the Trailblazer (tequila, vanilla, orange and chocolate, set aflame) and the fierce Death Flip (tequila, Jagermeister, chartreuse and a whole egg), suggesting that they can also be relied upon to create almost any drink you want off-menu. Hidden away anonymously behind a black frontage on a side street, the predominance of old-time music on the stereo suggests that a prohibition-style word of mouth hit is what’s being aimed for, although a friendly welcome and a range of tempting bar snacks (toasted sourdough sandwiches; vegetarian and meat-based mezze plates; popcorn flavours including Cajun and garlic & parmesan) also make for a unique and charming local. – Are you George Street in disguise?